Every person is familiar with candy floss, made at stands on fair grounds, or carnivals, in an expensive whirling machine. It is not necessary to wait for a fair or a carnival to have a bunch of candy floss, as it can be made at home much quicker than making taffy candy. 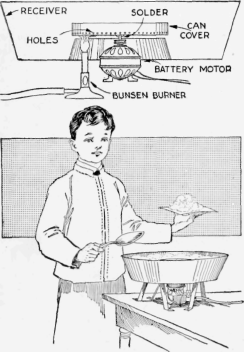 The device for making the candy floss consists of ordinary things that can be had in any home, and usually a boy has a battery motor of some kind that will furnish the power. Procure a tin pan, the shape of an ordinary dish pan and of medium size; cut a hole about one-half the diameter of the pan in the bottom and solder in a conical-shaped piece similar to a cake pan, allowing it to extend up inside about half the height of the pan. Fasten supports to the pan so that a Bunsen burner can be set under it where the flame will pass through the conical center opening. Mount a small battery motor with its shaft vertical, pulley end up, and centering the conical hole, on a base, which supports the pan. Procure a can cover, similar to that used on coffee cans, and fasten it with solder to the pulley on the motor shaft, being careful to locate it centrally so that it will run smoothly. Close to the bottom and in the rim of the can cover, make a number of small holes with a prickpunch, or other sharp-pointed tool. Wire the motor to the battery, and the candy-floss machine is ready for use. Light the burner, start the motor, and pour a little granulated sugar in the revolving can cover. As the sugar is melted, it will be spun out in floss form through the small holes into the pan receiver. - Contributed by Herbert Hahn, Chicago, Ill.